Receiving this error shortly after login and occasionally during play. Is there a way to make the tooltips show up only in the corner of my screen instead of right at the center or where my mouse is? It drives me nuts and often blocks what I'm trying to look at. I can't figure out if there's a setting that does it. type /tiptac and then in the lower left of the window there is a button called anchor. press and move anchor where you'd like it. If I try to use TipTac along with Total RP 3 and hover over a player with my mouse, a empty tooltip appears with small TRP3 symbols all over the place. Also, the tooltips for items in my trade window appear without a background. First of all, thanks for this addon. It's by far my favorite tooltip addon, and I've been using it for a loooong time. Now, I usually prefer to have my borders colored by reaction for NPCs, but by class for players. For a while I've been modifying the addon code myself to accomplish this, but I also noticed that in the comments you mention perhaps adding an option to have that as a possible behavior. Do you have any plans to have such option for real? I'd love to have it, not sure how many more people would too. Not sure if there's anything you can do, but I use TRP3 with TipTac, and the past few days when I have TipTac on, all TRP tooltips are blank. I reported this to the TRP people, but they seem to think it's an issue with TipTac. Any info would be great. :) Lovely addon, keep up the great work. You still cannot set the transparency in the background of the tooltip. It is stuck on 50% or so and nothing happens if you change it. The colored border is instant now though :) before it was like 1s delay on it. Also noticed now, when hoovering mounts thats in the actionbar it changes border and background to smore grid looking one :) and when hoovering minimap icons they are without any background at all. and when hoovering battle pets the "second" tooltip that comes up are transparent and without the correct border. Something is still fishy when hoovering mounts on actionbar, it looks like it applies a second layer or something like that. I changed background then THAT displayed correctly but something is different than hoovering spells and other items. And the problem with minimap tip, I dont think is a problem. because they all are affected correctly by border color and transparency, that is why it was transparent in the first edit :) because I had left it on that from the start since its not working on any other item, but on minimap icons it does. And 1 more thing, its just what I would prefer myself. I can see where it makes a new info line, but not how it is placed within the tooltip. Love the addon though and thank you for keeping it updated. Tiptac is completely invisible now, had to disable, but grabbed a screenie of it first. 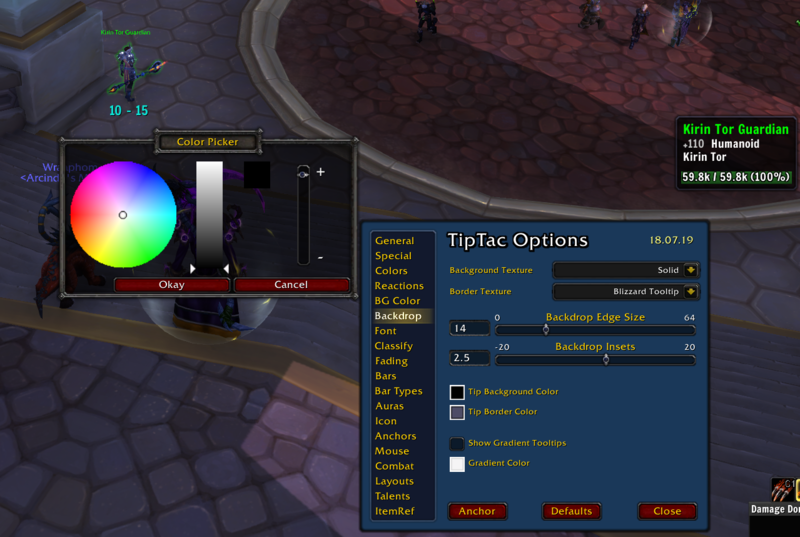 The white bar up near the lantern to my right is tiptac..
Any idea why the Twitch client doesn't see this addon as installed? Unfortunately, the Twitch client is terribly buggy when it comes to "losing" addons you have installed. I hate to say this is regular behavior, but it is, and despite reports to their technical support AND attempting their version of a supposed fix, the problem persists. For me, addons still disappear from the list and reappear later on their own. It's lame, I kinda hate it, and I feel your pain. Good luck! The tooltip background and border are default; at the spells on my action bar they are flickering around between default and what they should. The last update seems to fix this problems, but now the ITEM tooltip as a whole is flickering. Also, while I am inspecting someone, the tooltip background for equipped items of the player is totally gone.